Click on the thumbnails below for a larger image or click here for a detailed view of Alison's work. Alison graduated from Loughborough College of Art and Design in 1994 with a first in Fine Art Sculpture. She now lives and works in Lincolnshire. 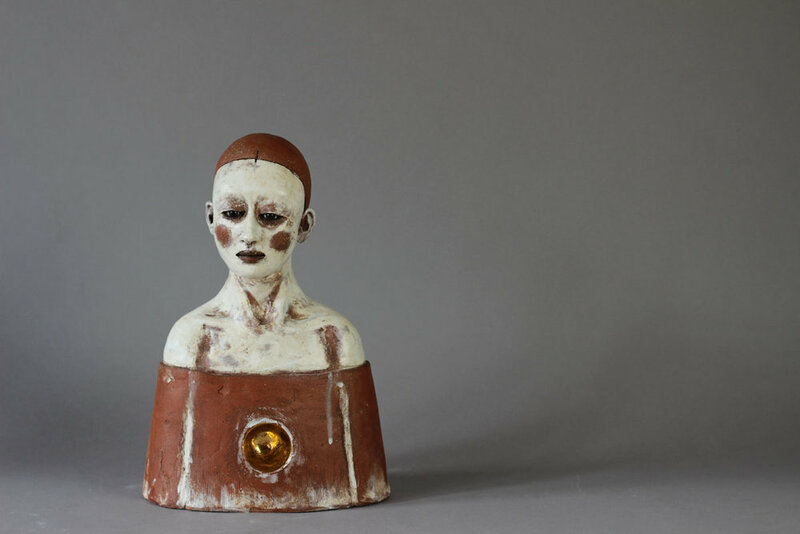 After working in mixed media for her degree, Alison returned to clay preferring its immediacy and flexibility. She hand builds in stoneware, coiling and sculpting, and uses a limited palette of matt white crackle glaze, gold lustre and occasionally ceramic decals reproduced from her drawings. Each piece has several layers of slip and glaze with areas left bare, creating pits and surface texture. Indian ink is then used to define the crackle. Her recent work includes the use of glass eyes, blown or hand painted, often intended for taxidermy. Alison is fascinated by the human desire to make sense of existence through religion, myth and folklore and the use of art to create concrete images of worship, in the form of icons and idols. Her use of this imagery helps to create a sense of familiarity within her work and this imagery is reworked using secular and personal iconography. Recent work explores mans relationship with animals and plays with the Madonna and Child, images found in Flemish art and the Reserve heads of ancient Egypt. Here you can see the creation from start to finish, of Alison Coaten's captivating piece 'Behold' Thank you to the artist for this video.